We’ve been doing this party for quite some time and somehow we’ve neglected one of our favorite bands. That’s why when we found out Depeche Mode’s Violator was about to turn 25 years old (!) 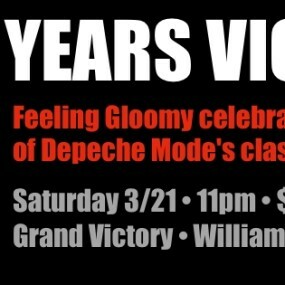 we knew it would finally be time for us to throw a Depeche Mode-themed Feeling Gloomy. + Feast on a homemade Depeche Mode cake. It’ll be the Sweetest Perfection.